A couple of weeks ago we were kindly invited by Zoggs to Coral Reef Waterworld in Bracknell. We live quite close, but hadn’t visited since Coral Reef was refurbished a while ago so I was keen to see how it had changed and of course to try the new DC Superheroes swimwear range from Zoggs. We chose a very coordinated Batman themed range of items, and the girls loved being able to match with their little brother. Zak and Hannah swim a lot so we’re very familiar with Zoggs, and especially love their Jammers and goggles. Charlie was desperate to get in the pool in the photo below! He protested a little when we put the water wings vest on him, but once in the water happily kept it on for the whole 2 hours we were at Coral Reef, so it must have been comfortable and definitely helped us holding him in the water. If you haven’t been to Coral Reef before, it’s definitely worth a visit if you’re local, but do book first as it can get quite busy. 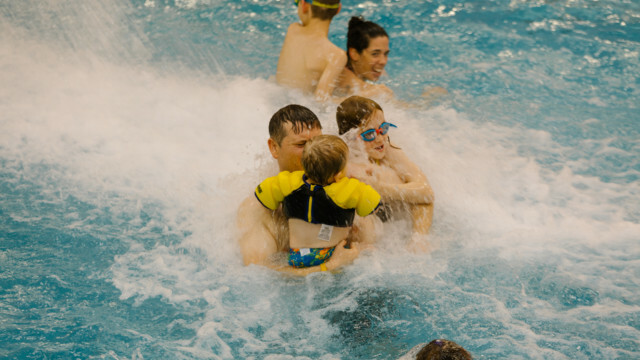 There is a large swimming pool with a pirate ship children can climb on and spray swimmers, as well as an erupting volcano, bubbly pool and rapids. For the over 18s, there’s a lovely spa area which I would definitely recommend. Zak and Hannah were most excited about the new water slides. Hannah and I loved sharing a raft down Storm Chaser, she was thrilled to be able to choose the theme of the slide before entering and enjoyed changing it each time. Aqua Splash is the most gentle ride and again you could choose from different themes. Zak’s favourite slide was The Cannon, which is very fast and shoots riders into the darkness. Little Hannah was very brave and also tried this, although Sydney and I stuck with Aqua Splash! Two other slides were closed when we visited, so the kids are very keen to go back and try them soon. We loved our visit to Everyone Active’s Coral Reef Waterworld and will definitely go back for more! 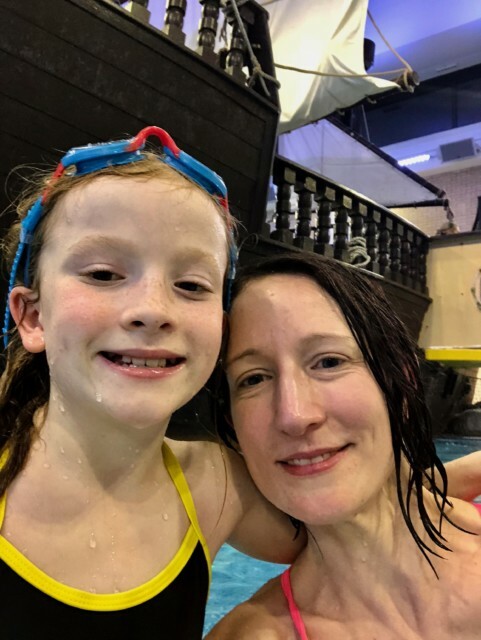 I confess to not generally being a big fan of swimming, despite having two swim squad little people, but it was actually a fantastic way to spend some quality time together, which is something that doesn’t happen very often. Swimming is an activity that everyone enjoys and can do together easily, which again isn’t something we find often with such a big age gap between the biggest and littlest. It was a really lovely evening together and we can’t wait to go back for more. I’d also recommend checking out the new DC Superheroes range from Zoggs, there are some great ( and slightly unusual ) pieces for kids of all ages. Thanks for having us Zoggs and Everyone Active! Oh your kids look so cute in their matching swimwear! Sounds like you had a really fun trip. Oh my kids would love those too! 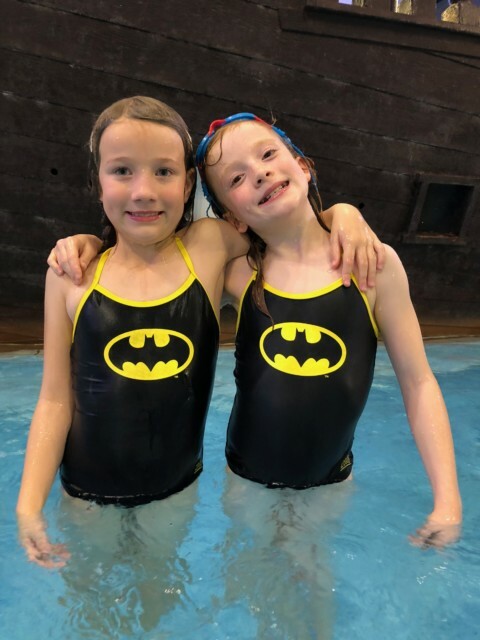 We have lots of Batman and Batgirl dressing up outfits but it’s always good to get something for their swimming lessons, I know they’d love matching stuff too. We love swimming, especially my two boys who are both Batman mad so would love the Batman swimwear. 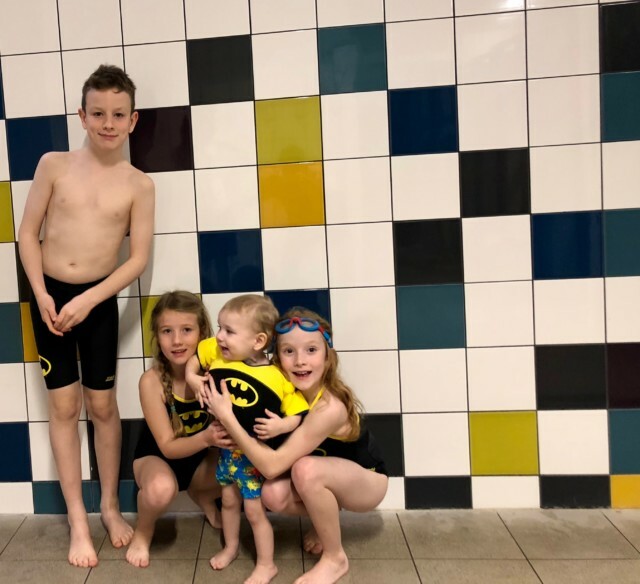 We love Zoggs too but I must admit I hadn’t realised that they have a range of DC Superheroes swimwear, great to combine their love of superheroes with quality swimwear from a brand I like as a parent….off to take a look and get them some for Christmas! What a fab looking swimwear range! Looks like you all had a fun day! I love the matching batman costumes! So cute. I can’t remember the last time I went to a water park. Coral Reef sounds like a great place to visit. I love the look of the swimwear you are wearing too. We had a water park similar to this one growing up and it was so much fun. It’s perfect for a day out without having to do too much in the water. I love the batman costumes as well.